France go into their final group match against Switzerland knowing they need a positive result to ensure they ensure they finish top of Group A. 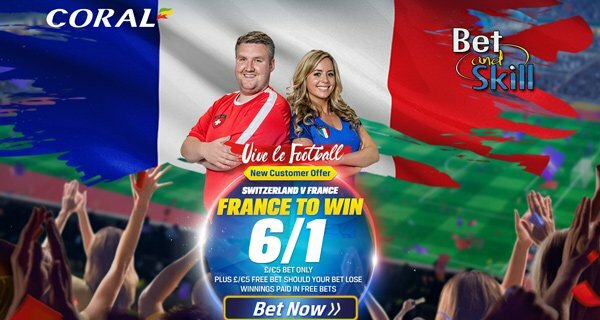 Find below our Switzerland v France betting preview with predictions, betting tips, enhanced odds, probable line-ups, streaming links, bookie offers and no deposit free bets on Euro 2016! Switzerland, meanwhile, have taken four points from their opening two matches - a 1-0 win over Albania ad a 1-1 draw against Romania. The Swiss team only need to draw against France in clash and could even make the knockout stages if they suffer defeat, depending on results elsewhere. The latest competitive meeting between the two teams came in the group stages of 2014 World Cup when the Swiss side were hammered 5-2 by Les Blues. Vladimir Petkovic is not expected to name an unchanged line-up for this clash but Valon Behrami, who is facing a fitness race, is a doubt. Haris Seferovic could be replaced in the starting XI after two poor displays and Breel Embolo could be handed his first start of the tournament. Mehmedi, Shaqiri and Dzemaili will be the trio behind the lone striker. France have two wins from two games so far, yet neither were particularly convincing. Having battled past Romania on opening night, Les Bleus made it two wins from two games with a 2-0 victory over the Albanians but both their goals came beyond the 89-minute mark. Winning the Group A is very important - the group winner will face a a third placed team from either group C, D or E.
For the Albania game Antoine Griezmann and Paul Pogba were dropped from the line up but that gamble didn't paid off and they are expected to return in the starting lineup. Blaise Matuidi loks sure to start in midfield while Moussa Sissoko is in contention with N'Golo Kantè. Didier Deschamps may choose to rotate more players though and rest the likes of Patrice Evra and Olivier Giroud. In that case GIgnac and Digne could start for Les Blues. Switzerland (4-2-3-1): Sommer – Rodriguez, Djorou, Schar, Lichtsteiner – Berahmi, Xhaka – Mehmedi, Dzemaili, Shaqiri – Seferovic. France (4-3-3): Lloris – Evra, Kolscielny, Rami, Sagna – Sissoko, Pogba, Matuidi – Payet, Giroud, Griezmann. "Switzerland v France predictions, betting tips, lineups and odds (Euro 2016 - Group A - 19.6.2016)"